A beautiful mistletoe heart shaped wreath with embroidered border detail. 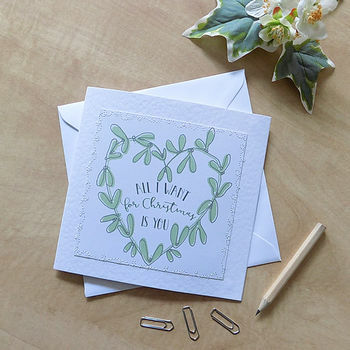 'All I want for Christmas is you' - The perfect card to send to your other half this Christmas! The card comes with a white envelope and is sealed in a cellophane bag for protection. The inside has been left blank for you to write your own personal message. 300gsm card and white cotton thread. This product is dispatched to you by Kate Dorothy.